Let the thickness of the bottom be x cm. => x = 10 cm = 1 dm. Volume of the large cube = (33 + 43 + 53) = 216 cm3. Let the edge of the large cube be a. ∴ Volume = 1/3 πr2h = 1/3 × π × 32 × 4 cm3 = 12π cm3. => h = (180/27) m = (20/3) m.
∴ Volume = (15 × 12 × 20/3) m3 = 1200 m3. So, r = √(l2 - h)2 = √(102 - 82) = 6 m.
∴ Curved surface area = π rl = (π × 6 × 10) m2 = 60π m2. So, Area = (1.5 × 10000) m2 = 15000 m2. 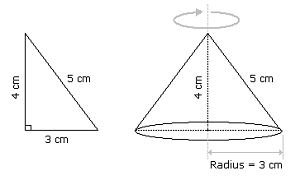 Depth = (5/100) m = (1/20) m.
∴ Volume = (Area × Depth) = (15000 × 1/20) m3 = 750 m3. ∴ Weight of iron = (462 × 8) gm = 3696 gm = 3.696 kg. How many bricks, each measuring 25 cm × 11.25 cm × 6 cm, will be needed to build a wall of 8 m × 6 m × 22.5 cm?